Drones are now a part of everyday life. Their popularity has increased in parallel with the recent great advances in their sophistication, power, affordability and ease of access. The drones available today are no longer simply toys for kids or hobbyists, but are increasingly being used for spying, drug smuggling, and industrial espionage. To make matters worse, drones can easily be fitted with weapons or explosives by anyone who wishes to physically harm rivals or governments. Drones are a true “threat from above” that present police authorities, governments and the security industry with a new challenge. Fences, video cameras and security guards no longer protect sensitive buildings or personnel adequately when your airspace is exposed. Sengex’s partner Dedrone has developed a technical solution to close this security gap. DroneTracker effectively protects your airspace from airborne threats by providing early-warning detection and alert in the event of a drone discovered within the protected space. DroneTracker utilizes an array of sensors to identify air space intrusions in real time. 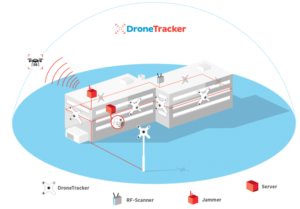 This unique sensing system enables DroneTracker to detect numerous threat parameters such as noise, shape, movement patterns, and frequencies. The built-in camera saves images and videos in HD quality, providing crucial evidence of the threat intrusion. The DroneTracker system manages your complete airspace surveillance solution in one easy-to-use browser interface. The software allows the configuration of multiple sensors, active and passive countermeasures and alerts. Via integrated interfaces for external sensor and flight data, the system is continuously supplied with real time information from the airspace. Applying analysis and intelligent pattern recognition by means of DroneDNA, drones are automatically detected and classified. Defensive measures against hostile drones can be activated automatically and security services notified. 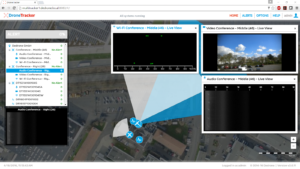 The user-friendly web interface DT Control Center enables easy configuration of any number of DroneTrackers or retrieval of data such as photos or videos. The monitored airspace can be viewed in real time on a PC or tablet. When a threat is detected, you will be notified via SMS, email, network message (TCP/IP), SNMP or Pushover.net. The DroneTracker can also be integrated into home/business alarm systems. For large area protection or perimeter protection, multiple Trackers can be combined in series.